Dice shaped mint tins with Made in the USA mints. Have a sense of humor and let your customers know it's never a gamble to do business with anyone but you! 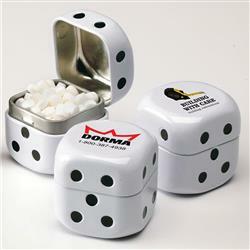 This larger than life dice shaped tin catches everyone's attention when given away at trade shows, conventions and sales calls. Imprint the tin with full color graphics. 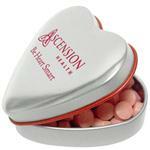 The tin is recyclable and shrink wrapped for your safety. Contains approx.1 oz. (28g) of delicious USA-made sugar-free mints. Dimensions: 1 3/4" x 1 3/4" x 1 3/4". Sugar-free MicroMints (R) made fresh in our facility. Peppermint will be provided unless specified otherwise on order. Non melt product. Custom mint shapes available. Available Colors: White & Black as Shown. 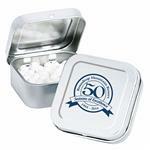 Dimensions: 1 3/4" x 1 3/4" x 1 3/4"
Typical Imprint Area(s): 1" x 1"
Micro Mints in Peppermint Only. Candy is Made in USA. Tin is recyclable and reusable.